Hope everyone is ready for Christmas! Just a quick note with a few housekeeping details for the end of the year. 1. Our in-store Blow-Out sale continues through the end of the year. 2. 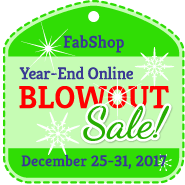 Join us on-line next week for the Fab Shop Year-End Blowout sale. 5. Classes will begin in February! 6. Sit n' Stitch open sewing begins Jan 18th. Need room to spread out? Need a larger cutting area?